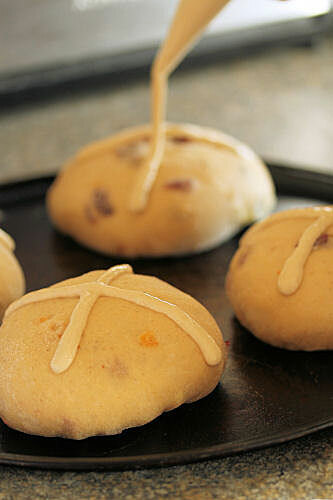 This year I added some white chocolate into my Ultimate Hot Cross Buns. If you roughly chop the chocolate into chunks that are a little under 1cm, when you bite into the bun you will get a lovely white chocolate blast. 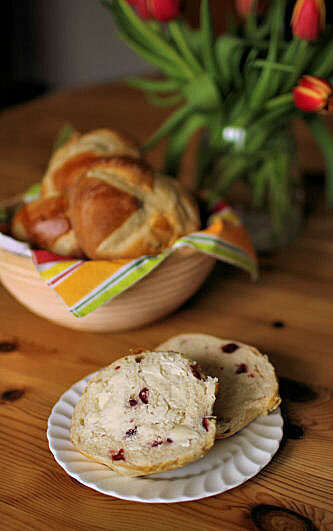 Combined with the cranberries, this recipe is a winner! 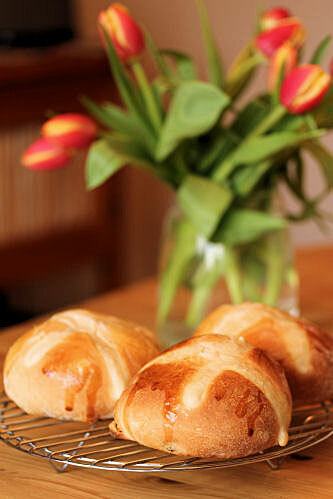 Full recipe can be found here: Ultimate Hot Cross Buns, just add about 100g white chocolate, roughly chopped. 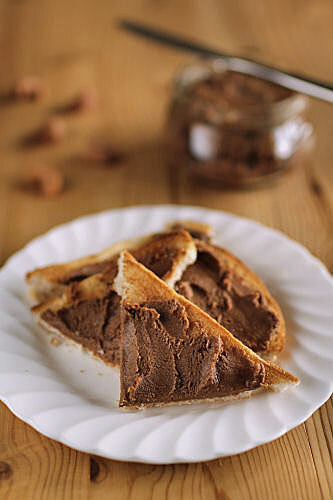 Here's something that made me do just that yesterday, chocolate honey cashew butter - oh yes - you read it right, CHOCOLATE + HONEY ROASTED CASHEWS (+ a tad of vanilla) YES!!! 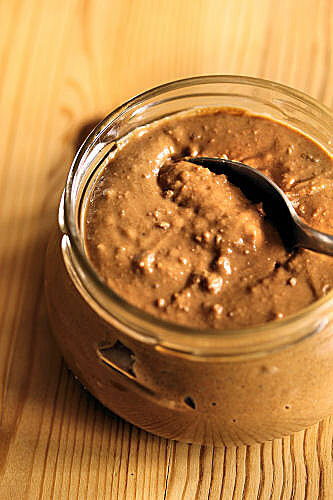 It was a pin on Pinterest that led me to Averie Cooks, to a recipe for homemade chocolate peanut butter. 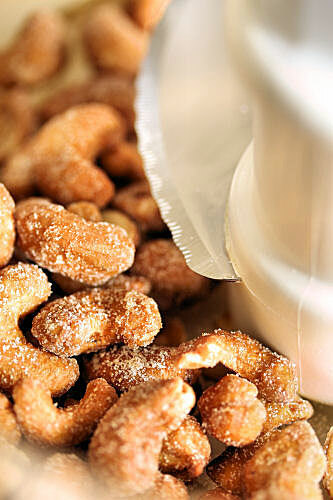 Just 3 ingredients and taking a little over 5 minutes, here's my version, using honey roasted cashews. 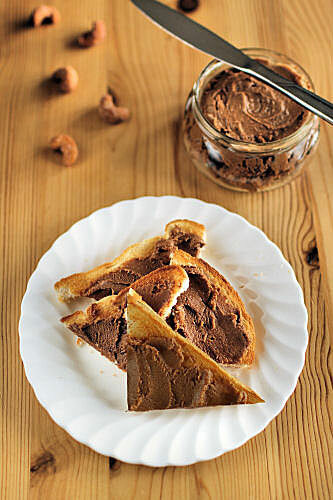 Adapted from Averie Cooks, the original recipe uses honey roast peanuts. I made a smaller quantity and cut down on the chocolate. Put the cashews into a decent food processor and process on high for about 5 minutes, until the cashews turn into a smooth and creamy nut paste- at first, the nuts turn will into a powder, but if you keep processing they will eventually break down into a soft butter. 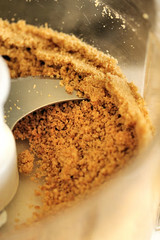 Add the vanilla and the chopped chocolate and process for another couple of minutes, until you have a creamy paste. 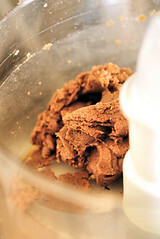 The warmth of the machine and butter will melt the chocolate into the paste. Transfer to a sterile glass jar and store in the fridge, where it will firm up (and keep for a couple of months) or at room temperature (keeps for a couple of weeks). I think it would make a great filling for sandwich cookies. Averie suggests a couple of other additions: coconut extract; coffee extract; espresso powder or a splash of bourbon. It's almost Red Nose Day here in the UK, a day when we are all asked to 'Do Something Funny for Money'. Comic Relief was launched back in 1985, from a refugee camp in Sudan, when a devastating famine was crippling Ethiopia. It was a simple idea - get a whole load of British comedians to make the public laugh, while raising money to help people in desperate need. Not long after, Red Nose Day was created. Happening every two years, the money raised goes to support people and communities both here in the UK, and in Africa. 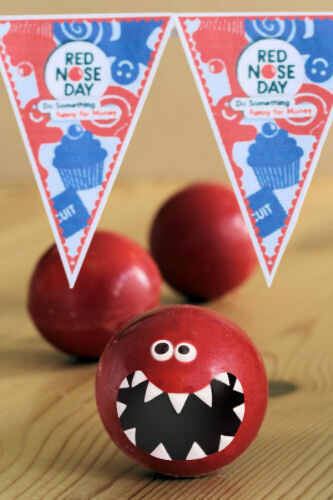 It's one of my favourite fundraising events, and since the first Red Nose Day more than £600m has been raised. 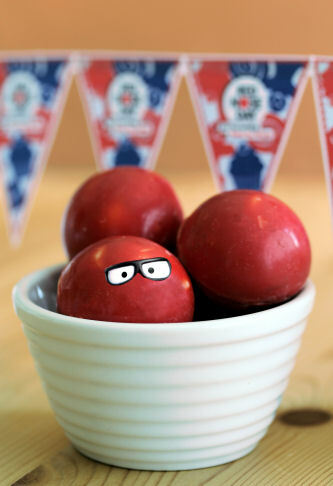 Here's my easy guide to make some edible red noses. 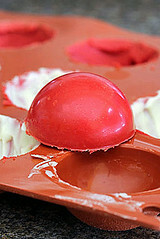 You do need some hemisphere silicone moulds, mine were 42mm in diameter, and some red candy melts to coat the moulds. Melt the candy melts following the instructions, then brush the inside of the moulds with the melted candy. Mine didn't go as soft as I wanted, so used a teaspoon to spread and smooth it into the moulds. Leave to harden. Sprinkle some popping candy onto the moulds (I think popping candy is mildly amusing) and spoon in some melted chocolate to cover the popping candy and strengthen the noses. 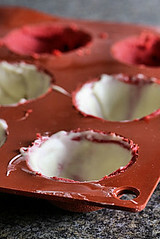 They will be too fragile to remove from the moulds if you don't add a layer of chocolate. Leave to harden in the fridge before removing them gently from the moulds. To assemble, heat a baking sheet or a frying pan on the hob and when it's warm enough to melt the chocolate, put one of the unfilled spheres onto the sheet for a second or two, remove and 'glue' it to another (filled) sphere, holding together until stuck. Repeat with the remaining noses. If you are good at icing, you can decorate them with some eyes and teeth, I left mine plain because I'm useless at that sort of thing. The faces on mine were added post photo production so you get the effect. 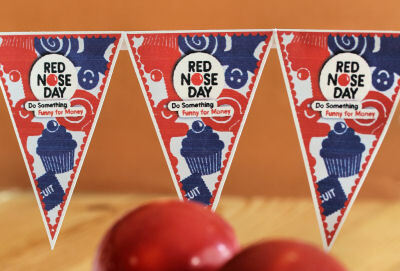 If you are not attending a fundraising event, you can still help to support Red Nose Day in other ways. 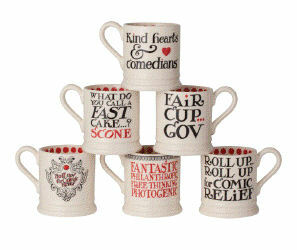 British potter Emma Bridgewater has created an exclusive range of Red Nose products, which are available to buy in HomeSense stores and TK Maxx. The money donated from the range will be spent by Comic Relief, helping people across Africa and here at home in the UK. 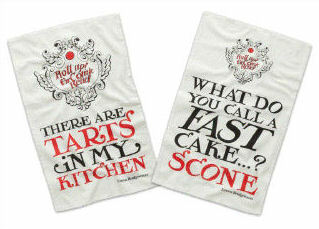 Here are some mugs and tea towels from the range, there is also a lovely double oven glove, aprons and a bag for life. Disclosure: I was not paid to write this post, all views are my own. 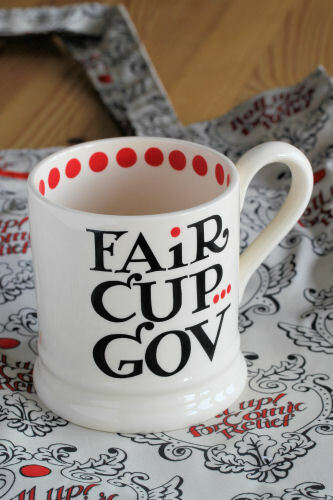 The photos of the group of mugs and the tea towels were supplied by Citizen Relations PR. Happy days are when you get sent two bottles of beautiful Chablis to match with your favourite takeaway food, in order to demonstrate how the wine can pair with different foods from around the world. b) if I am going to get takeaway food, it has to be something I don't/can't make as well at home. My husband was like "Really? 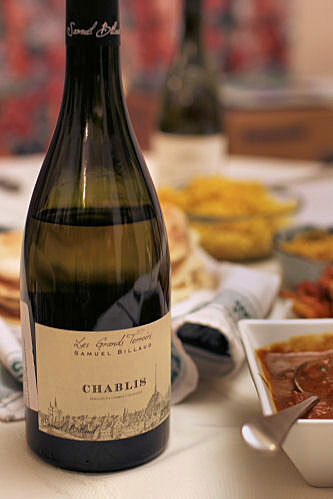 Chablis with Indian food? How's that going to work then?" I think he had been having a little look through the comprehensive tasting notes that has been supplied with the Chablis and had noted that one of the four rules of food and wine matching was that 'strong food should be matched with strong wine'. The label on the bottle read that it was perfect with 'fish and light dishes'! Chablis is produced in the northern part of Burgundy, France, along the Serein valley, where there is a specific climate and soil. Divided among 20 villages and hamlets, it is an area I would love to explore, with all those fabulous vineyards and excellent local food. 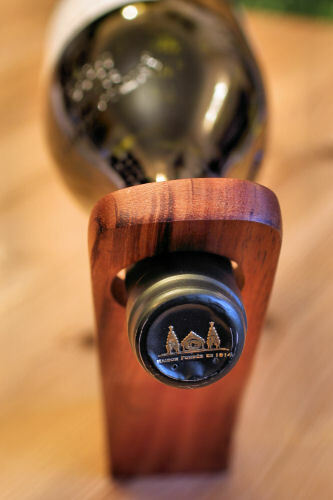 Exclusively made with the Chardonnay grape, Chablis covers four appellations: Petit Chablis, Chablis, Chablis Premier Cru and Chablis Grand Cru. The appellations are differentiated by very precisely-defined production areas and specific production conditions. The authorised yield varies from appellation to appellation, and the minimum sugar required in order to harvest the grapes depends upon the type of cru. 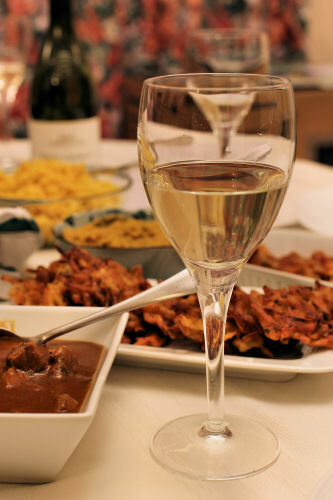 Well, I can tell you that both wines went pretty perfectly with our Indian dishes! 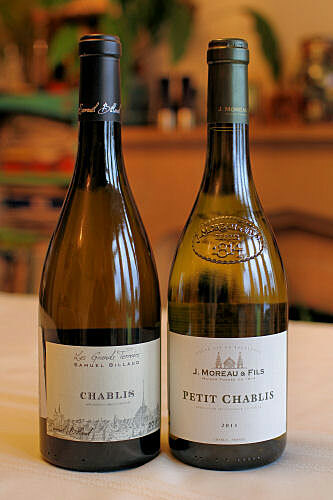 Of the two bottles I was sent, the Petit Chablis J. Moreau & Fils 2011 (Marks & Spencer, £11.99) was my favourite. It was a little lighter and sharper in taste. 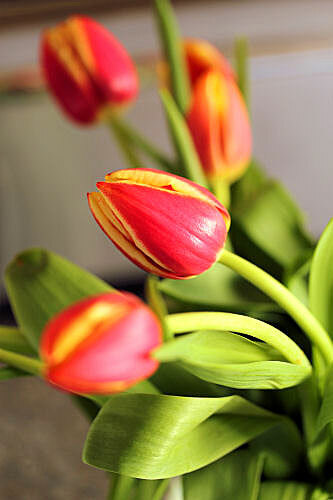 There was an incredible vibrant smell when the wine was opened, and it seemed quite lively on the taste buds. The other bottle was a Chablis, Les Grand Terroirs, Samuel Billaud 2011 (The Wine Society, £10.99) and this was a bit more earthy, more sophisticated, and had a certain deepness to it. 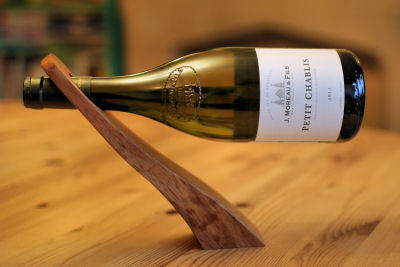 This Chablis would be just as lovely on its own, served well chilled. 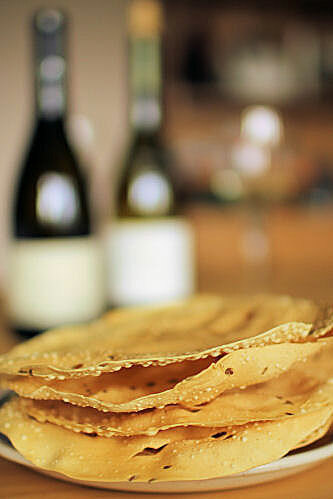 Surprisingly, the Petit Chablis was not overpowered by the strong spices of the poppadoms, I thought it complimented them rather well. 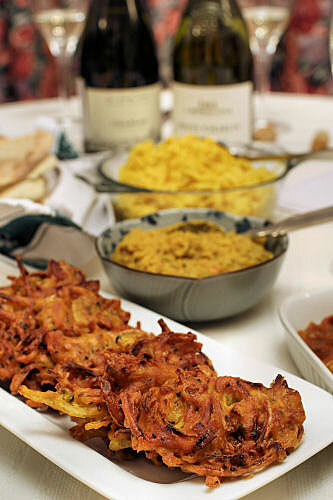 Less spicy, but equally good with the wines, onion bhajees. If, like me, you know nothing about wine but want to know how to taste it properly, there are three easy steps to follow. It's all about the colour- hold the wine glass by the stem and look at the intensity of the wine. The colour depends on the age of the wine and how it was made. Have a good sniff and then swirl the wine around in the glass, sniffing again to smell the aroma molecules which have been released. 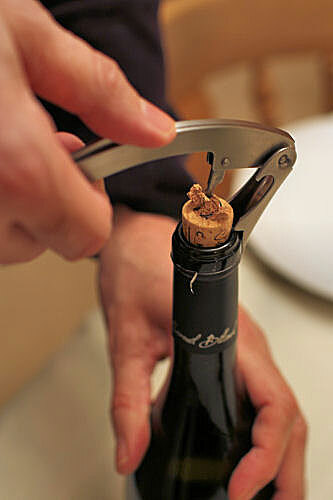 Have a little sip of the wine and try to detect the flavours that you picked up when you were sniffing the wine. 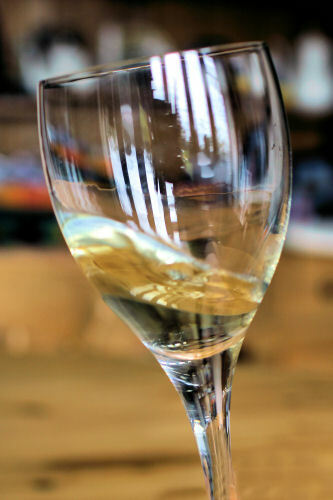 Your tongue and mouth have sensitive areas, so swirl the wine right around your mouth. I usually opt for a cider when having Indian food, or a beer, and I can honestly say I really enjoyed the change. I hope the wine producers don't hate me for my choice of spicy dishes, and that they try their wines with a little bit of accompanying heat themselves! Disclosure: I was sent two bottles of chablis by the Bureau Interprofessionel de Vins de Bourgogne so that I could take part in this challenge - Merci! 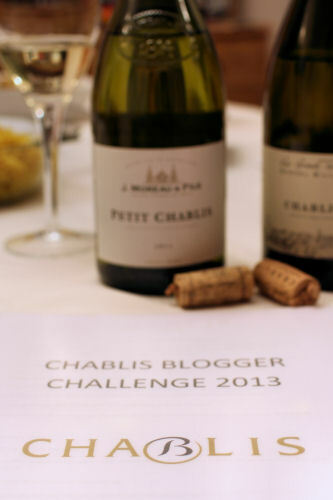 The winner of the challenge will win a prize of a trip to Chablis, to the annual tasting event.